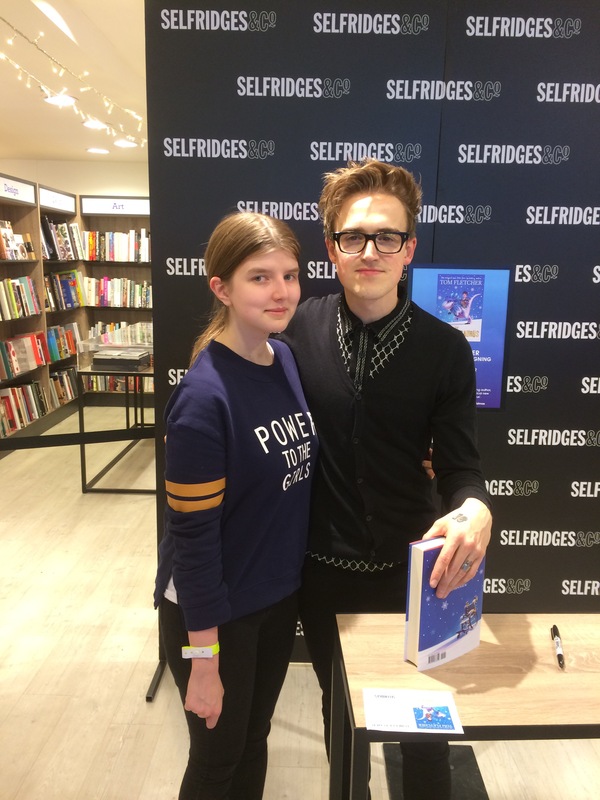 Last week, my friends Jen, Claire & I went to a signing at Selfridges to celebrate the release of Tom Fletcher’s book The Christmasaurus! And what with the news of a stage show of The Christmasaurus being released earlier in the week,I thought I would write about the signing! I was particularly excited about this one as I had grown up with McFly from when I was very young! I’ve been to a handful of book signings in my life but I’ve never experienced a book signing where the author was hugely mega famous. But I have to say it was really organised compared to some celebrity signings I’ve heard about before. The signing took place on the fourth floor of Selfridges, which was the highest I had ever been in the building. I’m usually drawn to the smell of the FoodHall. There’s quite a big WHSmiths at the top, where the signing took place. The signing took place in half an hour slots so it wasn’t a massive rush. You were given a copy of The Christmasaurus as well as a small notebook and a sampler of the audiobook in the Selfridges’ bag! When I was younger, I used to make my parents buy the cheapest thing they could find so I could go home with a bag! Right before we met Tom, there were members of staff on hand. Lots of security to keep the line in check as well as a staff member to carry your stuff for you and another to take your photo for you. This was actually a life saving idea since I could avoid any awkward selfie angles. Now unfortunately, I had lost my voice about two days prior to the signing and I was incredibly croaky. So when it came to actually talking to him – I couldn’t say much. Which is hard, because I can be quite the chatterbox. All I managed to get out was apologizing for my voice and wishing him luck with the book. But I had a fab time with Jen and Claire and that’s what matters. I hope this post isn’t interpreted as bragging rights – I promise it’s not! I thought I would post something a little different that was still bookish but could also showcase that I’m not as slick and polished as I appear to be! I’m super excited to get to The Christmasaurus this Christmas! Have you read it yet? Let me know what you thought!